It’s not often that you can call a game both beautiful and elegant. Onitama is one of them. It’s like all the fighting/martial arts metaphors you have ever heard all rolled up and applied into a board game. 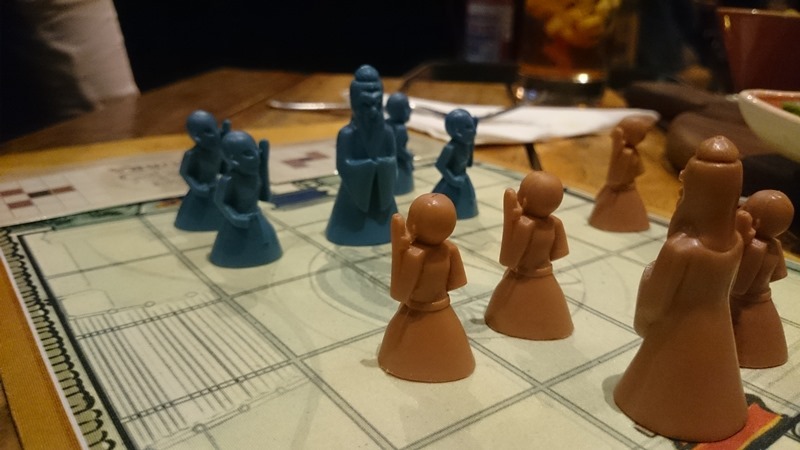 First released in Japan by Conception in 2014 and later in the US by Arcane Wonders, Onitama is a beautiful Chess like game from the mind of Shimpei Sato. It’s got a lot in common with Chess, often referred to as Japanese Chess but it’s not. 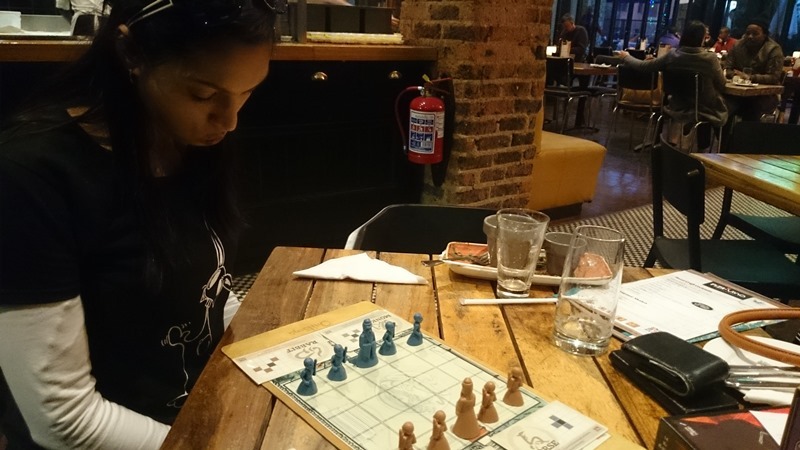 It’s actually easier to get into than Chess but if you want, you can find a similar level of depth in the game. I love the box, the art on the box appeals to me and the way it folds open to reveal the content is refreshingly different. Inside the box is a very easy to read rule book with lots of easy to understand examples. You can expect to be playing a game within about 5 minutes of opening the box if you just read the rules and skip over the fluff. There’s a rolled up neoprene mat which is used as the game board. It’s a 5×5 grid. Each player will get 5 pawns, either red or blue. 1 of these pawns will be the Master pawn. Everyone ends up calling it a king though. Then we have a stack of cards. Now in Chess each of your pieces has their own move set. In Onitama the moves that your pieces can do are represented by the cards that you have. There is a full deck of cards in the box but you will only use a random 5 of them for each game. 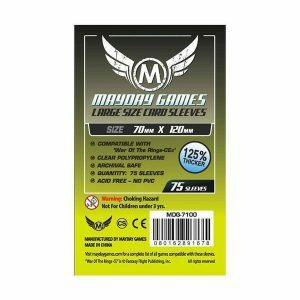 I’ve used these sleeves on my cards. I’ve got the premium sleeves which are thicker than normal sleeves but all of the cards still fit back into the box nicely. 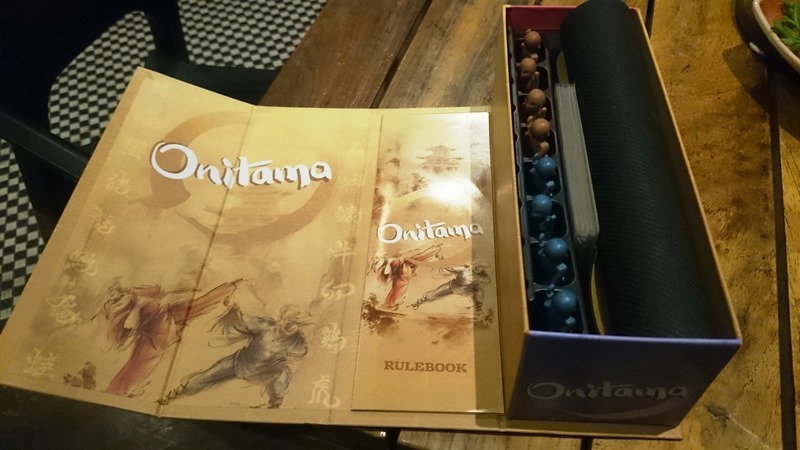 Onitama has the players become masters of a martial arts dojo. You endeavour to take your students high into the mountains to a sacred place in order to prove their worth and the strength of your dojo. Now remember this is Japanese martial arts, not western UFC. It’s more than just fighting style it’s a way of life. A balance between all parts of of the mind and body. Grace of movement, not just raw destructive power. Even the way the box opens is unlike normal boxes, it’s actually graceful in comparison you will never hear a “box fart” when closing it, your pieces in the box won’t shift if you store it upside down or sideways. I’m not a fan of the pieces, they look like robot aliens. So anyway, the different dojo’s are pitted against each other to prove their worth. They must either move their Master pawn across the board to the opponents shrine (Master Pawn starting place) or they must capture their opponents Master pawn in order to win the game. Setup is a very easy affair. Roll out the mat then place the 5 pieces of a colour on opposite sides of the 5×5 grid with the Master (king) in the centre. Then shuffle the cards and deal 2 to each player. There is a space on the player mat to keep these face up cards, face. Deal a 5th card off to the side. There’s a little mark on the bottom of the cards. If you look at the 5th card, the colour of the mark will let you know who the first player is. Arrange the card so that it is facing the first player. On your turn you will have to move one of your pawns. To do this you will look at the cards that you have in front of you. Each card is named after an animal and has a move similar to what that animal might be able to do. Eg a rabbit could hop over a square while a tortoise would move to adjacent squares only. Each of these cards has a grid on them with a solid dark square on it. This represents the square which the pawn that you wish to move is standing on, on the board. It can be any of your pawns, the king or the regular ones; they all have similar training and can perform any of the moves. Here you can see the cards that I have available to play in my turn. Other squares on the grid are either shaded in a light colour or just plain white. The shaded squares are where you can move the selected pawn to. There are a few restrictions though. You cannot move off of the board and you cannot move onto a space with a friendly pawn on it. If you move onto a space with an opponent’s pawn on it then you will capture that pawn. Once you have played your move you discard the move that you have made and then replace it with the 5 card. Then it’s your opponents turn to play and when he has made his move he takes the card that you used in your previou turn. He will likewise discard his move card which you will receive at the end of your turn. So in this way both lf you will keep cycling between moves, almost like you’re dancing with each other. The game continues until 1 player either gets their king to the other players shrine (the starting point for the king) or captures the opposing king then he is the winner! Have you ever taught someone a game for the first time and straight after playing it they say “Again.”? Onitama does that rather often. On the surface it’s very easy to teach, learn and even to watch. It’s got layers though. Just like Chess it’s a perfect information game. That means you know every pieces of information available to all the players. You can plan as many moves ahead as your brain is willing to let you, or you can just play for the fun of it and see what happens. I love Chess, I‘ve played more than 10 games this year already. I never really did the whole “plan 2 moves ahead” thing though, it felt like work. In Onitama does not feel like work. It feels like you’re dancing this intricate weave with someone else. Only, it’s in your head. The way the moves are exchanged and the fluidity of the board is just great. It’s also fun to watch too. To see people’s faces as the game clicks is great. 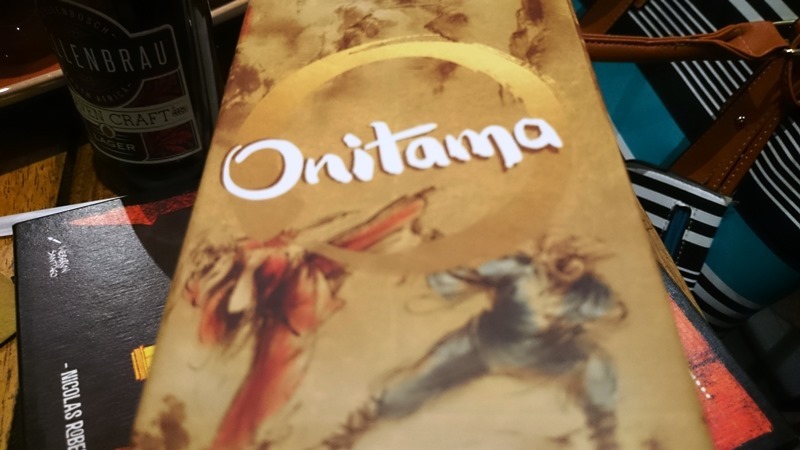 Onitama is easily one of my favorite 2 player games. 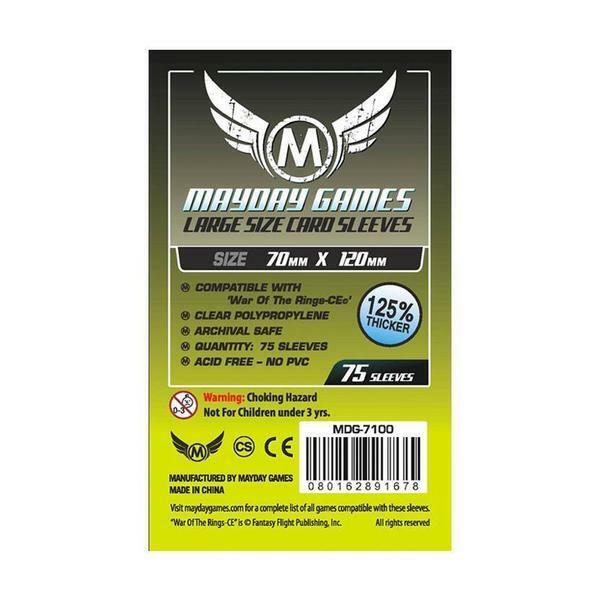 It’s great for teaching people to plan ahead, as a filler game or as light entertainment. However with the right opponent it can become a serious battle of wits. 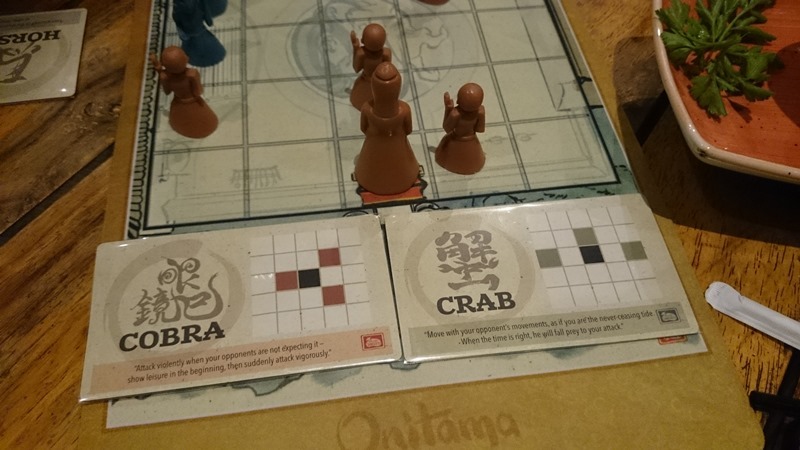 This was the first time the Mrs was playing Onitama. The images I’ve used in the post were all taken while my wife and I were having dinner at a local restaurant. We sat at one of those small 2-4 seat square tables. It does not need a lot of space and aside from the cards the components are pretty durable. I can see this on the patio table alongside a bottle of white wine while I’ve got something on the grill.